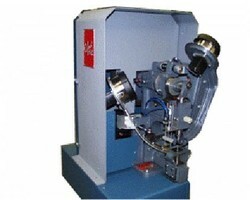 The Edward Segal Inc. Model 83GW-U is a fully automatic grommet machine that feeds and attaches both the grommet and washer, all in a single cycle. 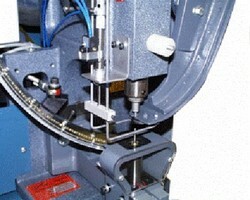 This macvhine is unique as it is designed for applications with pre-punched holes. The operator simply loads the material over the lower tool and actuates the machines. The result is a strong, durable quality setting. · Stronger Settings: material is not cut out, but is clinched between the grommet and washer. · Reduced Operator Fatigue: the operator simply positions the materials and cycles the machine. Dimensions (W x D x H): 30" x 30" x 66"